Testing is necessary to ensure performance adequacy, avoid unnecessary expenses, and aid in design reliability of the product. The process can be defined as a method of determining performance by exercising or operating a system or item using instrumentation or special test equipment that is an integral part of the item being tested. Testing a product to failure using normal operating conditions is often unfeasible economically, especially in the current competitive business environment. Instead an accelerated life test is conducted at higher stress levels, which shortens test time and reduce test costs. 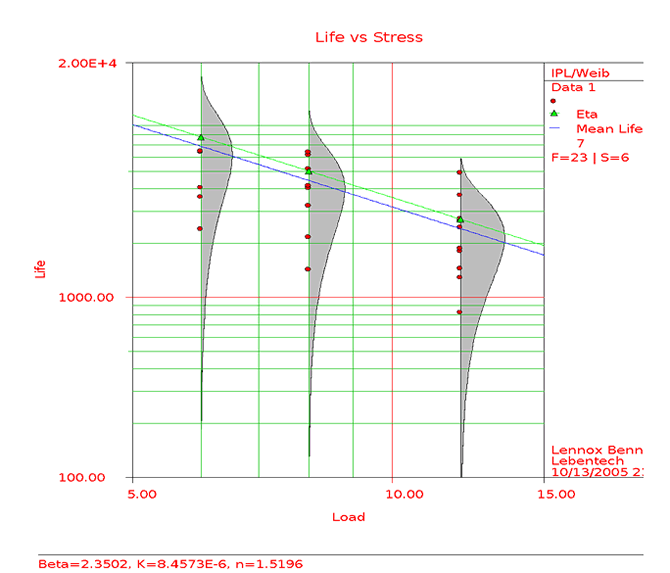 The life data obtained from the test are then extrapolated using a life-stress relationship to estimate the life distribution at a use condition. For high reliability products it is common to apply accelerated life testing strategy for evaluating reliability. Our consultants help our clients with technical considerations that include: selection of the appropriate stress levels that will yield the correct linear relationship and meaningful results, the selection of the appropriate operation stress that can induce failure, sample units and size, data collection and analysis methods. The consultant then develops the feasible test plan to be executed to support the assessment of the reliability of the design. A typical accelerated life testing application is illustrated in the testing of a Bosch dishwashing machine. This video is provided for use courtesy of Bosch and the testing was performed by their team at Bosch facility. For accelerated life testing our consultant model the data required to develop the life relationship. Typical models applied for ALT includes: Arrhenius Acceleration model, Inverse Power Law, Miner’s rule, Coffin-Manson, Eyring, degradation models, Pecks, and Thermo-mechanical Stress. We can help your company deliver products with higher reliability at a lower cost and in less time by supporting your accelerated life testing reliability program. We also recommend whether over stressing or increasing usage rate is the appropriate acceleration method for your specific product. Do not hesitate to contact us if you are looking to partner with a company that can help you apply accelerated testing to yield reliability information more quickly. 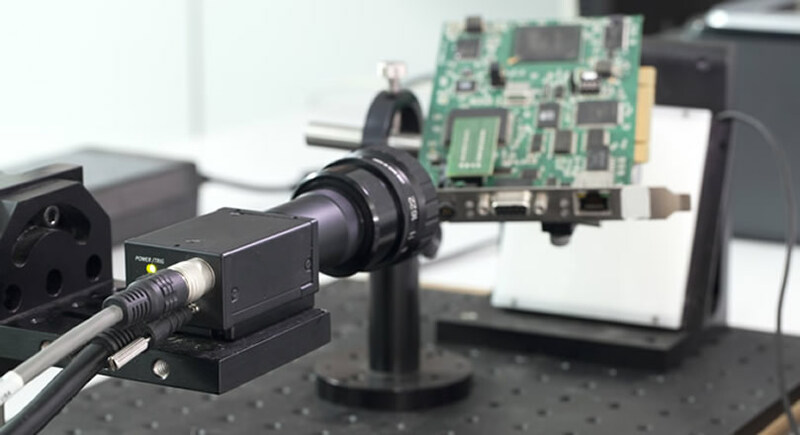 HALT/HASS is a design verification method used for testing electronic and electromechanical devices. This testing can be done at the component or system level. We recommend the appropriate stress type that will stimulate and precipitate specific failure mode. We also help with the development of the appropriate test profile for the applicable stress. We are experienced with planning and execution of accelerated life testing including HALT and ALT and similar test methods employing temperature, humidity, vibration, and power variation and cycling stresses on electronics, electrical, or electro-mechanical products to discover and correct weaknesses. We are also knowledgeable in ESS, HASS and HASA, and related production screening methods for eliminating latent manufacturing and part defects from production units. A typical profile for temperature and vibration is provided for illustration below. Detail test reports – engineering analysis, executive summary that explains method of data analysis, the significance of the results, and recommendations for product improvements. Reliability growth testing is a series of test conducted to disclose deficiencies and to verify that corrective actions will prevent recurrence in the operational inventory. 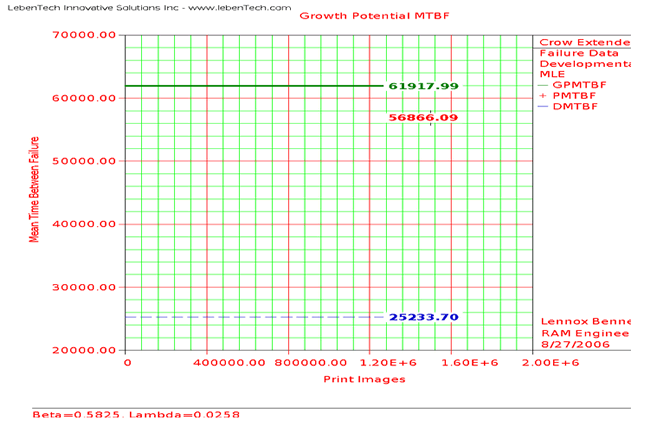 Reliability growth modeling is typically applied to predict future failures and track reliability improvements of products. We help our client’s in the application of the technique at different stages of the product life cycle. For our customers who desire information on the product reliability and improvement, or if the product will meet reliability requirements, we help them develop and analyze reliability growth models. Our experience consultants designed reliability growth test and select from an array of models such as Duane, Gompertz, Power Law, Lloyd Lipow, Crow AMSAA, and Crow Extend for application. We analyzed the data to provide information and practical innovative solutions. The graphical illustration in figure above represents our application of the Crow Extended Model for reliability growth projection. This case study is the output of reliability growth testing conducted on a complex electro-mechanical system. For products that are in service our consultants also utilizes reliability growth application for analyzing failures of repairable systems. An example of the power law model application used for this purpose is illustrated below. We work with our customers to identify the appropriate growth testing strategy as well as help them develop a unique reliability growth program for their products. 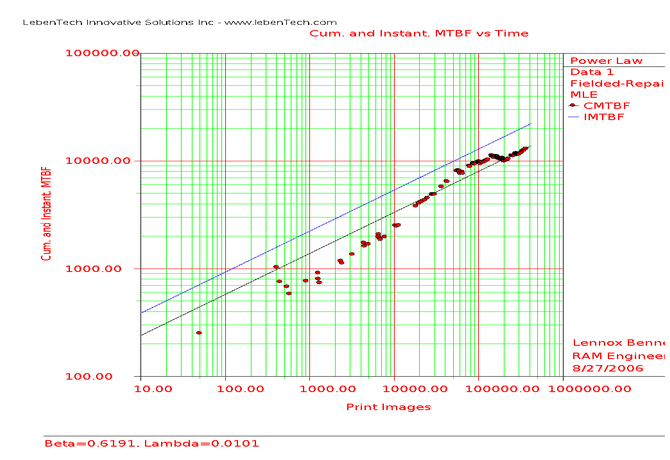 Detail test reports inclusive of engineering analysis as well as reliability projections. We recommend the appropriate test strategy to be developed for performing measurements on specific item or program. Strategy recommended will serve as a means to verify the achievement of the product goals and determine short comings that required corrective actions and opportunities for improvements. Detailed uniquely structured reliability test plan.